I never thought the Canadian government would do this and the fact this is happening is alarming to say the least. A Vancouver woman has been barred from living in Canada with her husband, partly because he is Muslim and she was born Christian, CBC News has learned. Selena Paskalidis married Sadaqat Hussain, of Pakistan, last year. Canada has denied him entry to Canada, citing concerns because the two "differ in culture and religion." 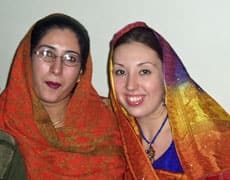 Selena Paskalidis (right) and Sadaqat Hussain were married in Pakistan with three traditional ceremonies. "I never thought my government would try to break my marriage up because of culture and religion," Paskalidis told CBC News. She is now preparing to move to the Middle East and leave her family and job behind. It was a difficult choice she felt was forced on her by the government. "We provided ample proof of our wedding and our history. It's not like we just met and got married. We had a history of being together," Paskalidis said. "I think we're being discriminated against." The couple met three years ago in Japan. Paskalidis said they travelled together and fell in love. They were married in Pakistan a year and a half ago. There were three traditional ceremonies, attended by dozens of friends and relatives. Paskalidis has since converted to Islam. She applied to sponsor her husband to come to Canada. The application met the initial tests for approval, as Hussain has no criminal record and their Pakistani marriage certificate was found to be valid. The application hit a road block, though, when the visa officer representing Canada interviewed Hussain at the High Commission in Islamabad. According to the couple, the visa officer, Syed Abdul Hameed, is also a Pakistani Muslim. In rejecting Hussain's application, he said, "I have determined that the relationship between you and your sponsor is not genuine." Citing his reasons in a letter, Hameed wrote, "You and your sponsor differ in culture and religion. Wedding between you and sponsor was not well-announced and even close relatives were not invited." Paskalidis disagrees. "We had over 200 people come to our weddings. We had three ceremonies. Is it because it's not what they think a Muslim wedding should be about? This [letter] says to me I'm not supposed to marry a Muslim." Hameed also cited concerns about Hussain working illegally in Japan and Korea. However, the visa officer's notes from the interview suggest difference in religion was a primary concern. Despite Paskalidis' conversion to Islam, he wrote, "They both appear to be of different faiths and there is no conversion to Islam on file for the sponsor." Paskalidis said she doesn't know what to do. "It's hard when you are coming up against something that is so much bigger than you, which is the government....Do they want me to come to the [government offices] in a hijab? Would that make them happy?" She broke down in tears when she talked about having to leave her mother behind in Vancouver. "I have to take care of my mom," she cried. "And that's the hardest part of the whole thing, is that I have to leave her by herself." Selena Paskalidis (right) has since converted to Islam after marrying Sadaqat Hussain. Paskalidis is also worried about raising children in a foreign country. Reached by CBC News by telephone in Lahore, Pakistan, her husband said he is concerned about that as well. He said he's worried about how Paskalidis will be treated as a Western woman in the Middle East. Hussain said the main reason he wanted to come to Canada was so that his wife could stay in her own country with her family. "I heard about Canada as a country where foreigners are most welcome to come and work … but personally, after having this experience, my feeling is now not to go to Canada," Hussain said. He has background in the construction business and he said the opportunities are actually better for him in a place like Dubai. "I don't need to go [to Canada]. I did not take this marriage for a benefit, you know. I just got married because we love each other." Vancouver immigration lawyer Zool Suleman told CBC News: "It's quite shocking — but it's not the first time I've seen it....It happens every day. People with different norms [overseas visa officers] are making decisions about what Canadian society should be. To me, that's not acceptable." Suleman said overseas visa officers have too much un-checked power. He supports the position taken by the Canadian Bar Association, that overseas interviews should be recorded and attended by legal counsel. "At every level there has been resistance from Immigration Canada, partly because I think they are afraid as to the results that will show up, the kind of disparities in decision-making that exist," Suleman said. A spokesman from Citizenship and Immigration Canada refused to comment on the Paskalidis case, citing privacy issues. Statistics provided by the Immigration and Refugee Board (IRB), which hears appeals of overseas decisions, show 53 per cent of those decisions are overturned when they are heard in Canada. The IRB holds an entirely new hearing, without being bound by the visa officer's initial decision. Yet, there is a backlog and it can take more than a year for appeals to be decided. Paskalidis is appealing, but said she won't be waiting in Canada to see the result.